Bitochon created a custom website design for this luggage company. The Ecommerce site provides great visibility of the company’s merchandise, allowing shoppers to clearly see what they are ordering. 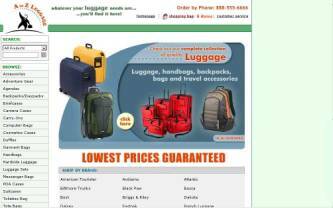 Customers can browse and shop different luggage brands, colors and sizes. Orders are accepted via credit card and stored in a database for future reference. Site administrators can maintain brands and products, process orders and change available merchandise whenever needed without relying on a programmer.